Mercy, a Nigerian, is the Assistant Specialist, Cassava Seed Systems at IITA-Ibadan. Mercy is a plant breeder who gained her PhD degree in Plant breeding and Genetics (2017) from the University of Ghana under the WACCI scholarship while her Master and Bachelor degrees were obtained from the University of Ibadan and Delta State University respectively both in Nigeria. 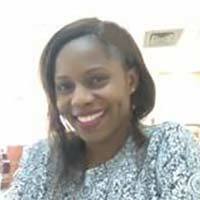 Elohor has worked extensively on cassava from plant conservation via tissue culture and cryopreservation techniques during her position as a research fellow and research supervisor at the Genetic Resources Centre of IITA. She worked on genetics and physiology flowering of cassava as PhD research, which is one of the objectives of the NextGen cassava breeding project. She is involved in breeding activities of the Cassava breeding unit of IITA. Due to her remarkable research work, she became a Norman Borlaug LEAP fellow having an aspect of her research work carried out at Cornell University where she held the post of a visiting scientist. Her previous job was an International Trials Manager with the BASICS seed systems project at IITA, a position she held till April 2018 and rapidly garnered experiences in cassava seed value chain.